The premium end of the compact camera market seems to be one segment that is continuing to innovate and grow, among a general market that has seen some downturn. Now pretty firmly established as the go-to brand of choice for those looking for something ultra-premium, Fujifilm looks like it will soon have some serious competition in the shape of the 16 million pixel Nikon Coolpix A. 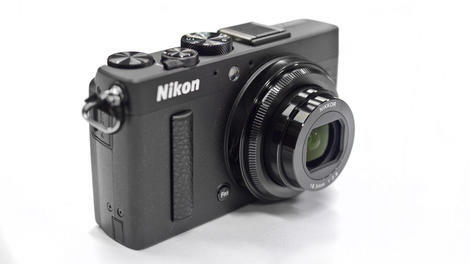 Like the Fuji X100 and Fuji X100S, the Nikon Coolpix A features an APS-C sized sensor. In fact, it’s the very same device as can be found in the Nikon D7000, the company’s mid-level enthusiast DSLR. It also features the same Expeed 2 processing engine, which should mean that it produces images of a very similar quality to the DSLR. Interestingly, Nikon has removed the optical low pass filter from the sensor, which should make the camera capable of pushing the maximum resolution from its sensor for ultra-fine details. It does mean that there’s an increased risk of moiré patterning, but Nikon believes that this shouldn’t be too much of an issue for the intended users of the camera, who would prefer the higher detail results. The camera features a fixed length 18.5mm lens, which is equivalent to 28mm in 35mm terms. It also offers a maximum aperture of f/2.8. Sensitivity may be set between ISO 100 and 6400, while active D-Lighting, a feature of Nikon DSLRs, is also included. Arguably, it’s not just the Fuji X100/ X100S that the Coolpix A takes on, but also the likes of the Canon G1 X, which doesn’t feature an APS-C sized sensor, but does have one that’s almost as large, and is the company’s main premium compact. Other premium compact cameras in the market include the Sony RX100, Panasonic LX7 and Olympus XZ-2. Another reasonably close competitor is of course the Sony RX1, which features a full-frame sensor. But given that that retails at £2,599/ AU$2,999/ US$2,799.99, the Coolpix A – priced at £999.99 (around US$1,506/ AU$1,484) – could even be considered an "affordable" alternative. It’s quite difficult to believe that Nikon has managed to cram a DX or APS-C format sensor into a compact camera which is smaller than the Nikon P7700, one of its other premium offerings. In fact, the sleek exterior of the camera makes it one of the more pocketable options in the premium market, large sensor or not. It’s perhaps not quite jeans pocketable, but it’s certainly jacket pocketable, and a very flexible option. Constructed from magnesium and aluminium alloy, the Nikon Coolpix A remains nevertheless very light, and won’t add too much bulk to a kit bag. It feels solid and weighty enough though to give it the air of high quality that its price tag suggests. There’s no hand grip on the camera, but a small strip on the front lends it extra purchase, especially when shooting one handed. Anyone used to a Nikon DSLR will be familiar with the menu layout and controls of the Nikon Coolpix A, which has been based around the design of the cameras higher up in the range. A mode dial at the top of the camera can be used for quickly switching between the various shooting modes on offer, including fully automatic, fully manual and semi-automatic modes such as aperture priority. Handily, there’s also room here for a couple of user-defined groups of settings, which is useful if you often find yourself shooting in any given situation, such as low-light. Another feature that’s also likely to be appreciated by the more advanced photographer is the customisable function buttons on the front and back of the camera. The small button on the front can be found near the lens and can be set to a number of different parameters, including ISO and switching between raw and JPEG format shooting. At the top of the camera, within easy reach of the thumb, is a small dial, which can be used for making alterations to shutter speed, or in combination with one of the other buttons, such as ISO or exposure compensation. At the back of the camera is a dial for altering aperture, when in aperture priority mode. At the side of the Nikon Coolpix A is a small switch for altering the focus mode. Here you have the option to choose standard focusing, macro focusing and manual focusing. When in manual focusing mode, a ring around the lens is used to fine-tune focus. You can also magnify the scene for critical focusing using a button on the back of the camera. It’s a shame that the ring around the front of the lens can’t be used for other functions when not manual focusing, for instance, altering aperture, such as on the Sony RX100. To change the autofocus point, you first need to hit the OK button at the back of the camera, and then scroll around the screen using the directional keypad. This can be a little bit of a long-winded process, and if you’re keen to capture fast moments, it might be easier to set the AF point to the centre of the frame and focus and recompose. It would have been nice if Nikon had chosen to incorporate a touchscreen here, since this would have made changing the AF points much quicker, and would better suit the quick street photographer that this camera is clearly aimed at. It would also have given it a point of difference from the Fuji X100S and Sony RX1. It’s very difficult to pass any kind of judgement on a camera at this stage, but with the Nikon Coolpix A, we can be reasonably assured that the image quality on offer will be excellent. With a large DX format sensor, and the excellent image processor, image quality should be very high, and certainly streaks ahead of that offered by other compacts in the Coolpix range. Our initial time with the camera indicates that it can offer pretty quick autofocusing speeds, while the macro focusing mode enables you to get reasonably close to the subject and is also pretty speedy. Manual focusing, via the ring at the front of the camera, is smooth and will be especially appreciated by videographers. The screen on the back of the camera offers a very clear view of the subject being composed, and didn’t seem to suffer too badly from glare or reflections during the limited conditions we were able to use the camera in. There’s no electronic viewfinder available for the camera, though an optical device can slot into the hotshoe as an optional extra. We’ll be very keen to put the Nikon Coolpix A to the test in a variety of conditions when a full review sample becomes available. In the Coolpix A, Nikon has produced a very interesting premium compact camera, with the added bonus of a sensor that has already proved its mettle in the Nikon D7000, an added incentive for anyone on the fence. It’s interesting that the company has chosen to remove the optical low pass filter, something that is also true of the Nikon D800E and the recently announced Nikon D7100. That said, with an asking price of just shy of £1,000 (around US$1,506/ AU$1,484), this is a serious investment, and not one to be taken lightly. Though it’s not quite up there with the asking price of the Sony RX1, it’s also worth pointing out that it does have a smaller sensor. At 28mm (equivalent), the focal length will be popular with street photographers, and could be the ultimate carry around camera if the battery life proves to be decent. Watch this space for more information as the full review sample becomes available.